My sister gave me a handmade photo album of our wedding. 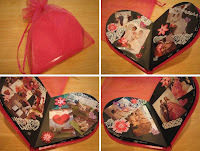 How sweet she chose pink heart-shaped album! I loved the way she put those cute & glittering stickers to decorate the pages :D Those stickers are put it in the way I want! I think only siblings know this kind of tastes, you know! hehe!